Unfortunately, as is the case with life at sea, the weather can change in a heartbeat and the seas apparently had enough of the spoon feeding we were enjoying. 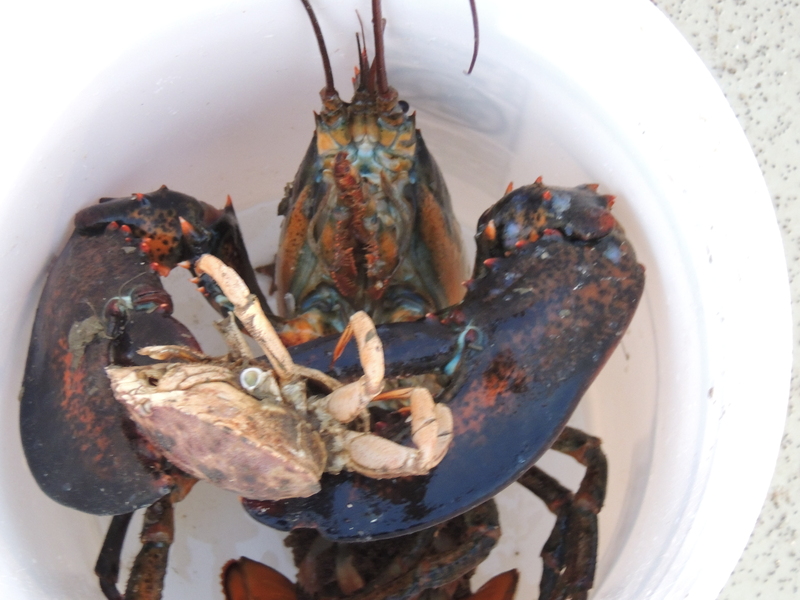 Our last couple of days were supposed to be spent exploring some new lobster habitat, but it just wasn’t in the cards for us and our cruise was terminated a day or two earlier than anticipated. When the weather got harsh while heading in, I asked our Captain if he would take a picture of me in the Crow’s Nest, doing my best Lt. Dan impression. He just smiled, shook my hand; “No” was all he said. I’m off the vessel, but, the learning is still sinking in. 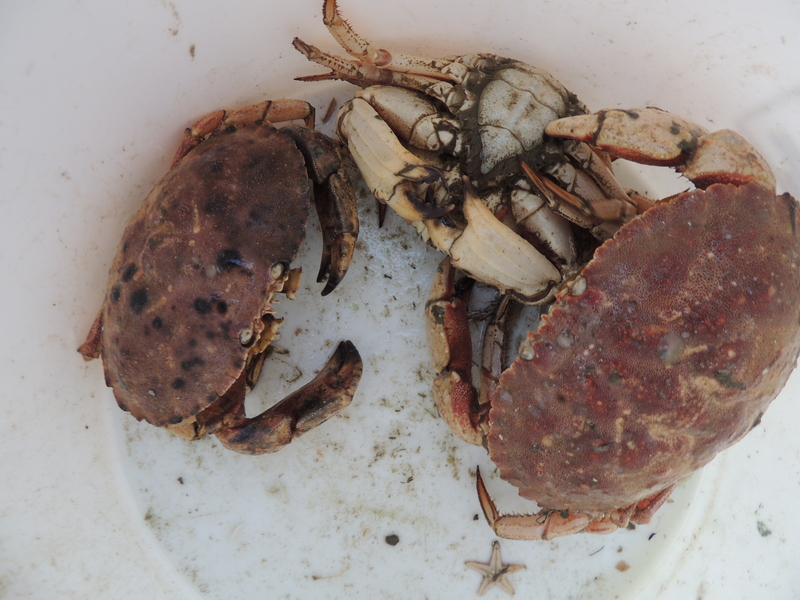 Today I’ll visit a little about the importance of annotating photos and round out the discussion with some explanation of how these scallop surveys play in commercial fisheries management, and then I’ll cut you loose for the summer. 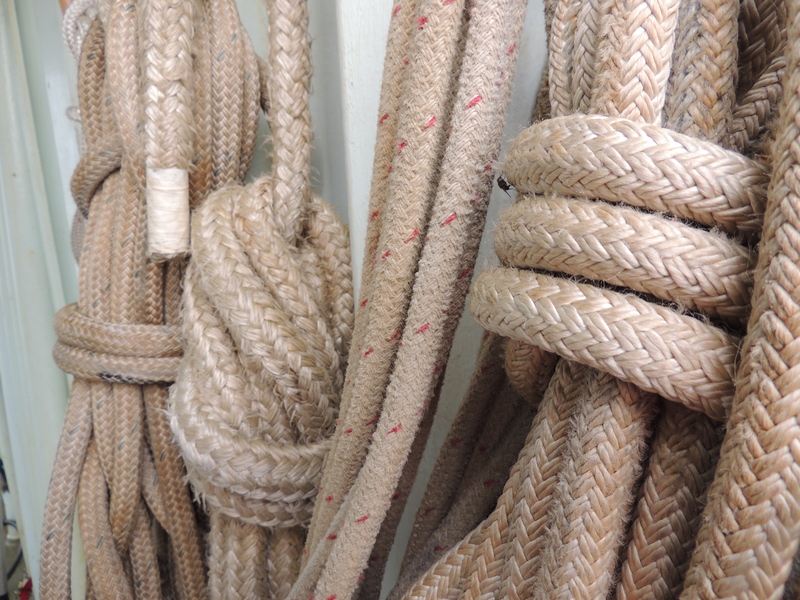 Ropes, used on hatches, which we may or may not have battened. 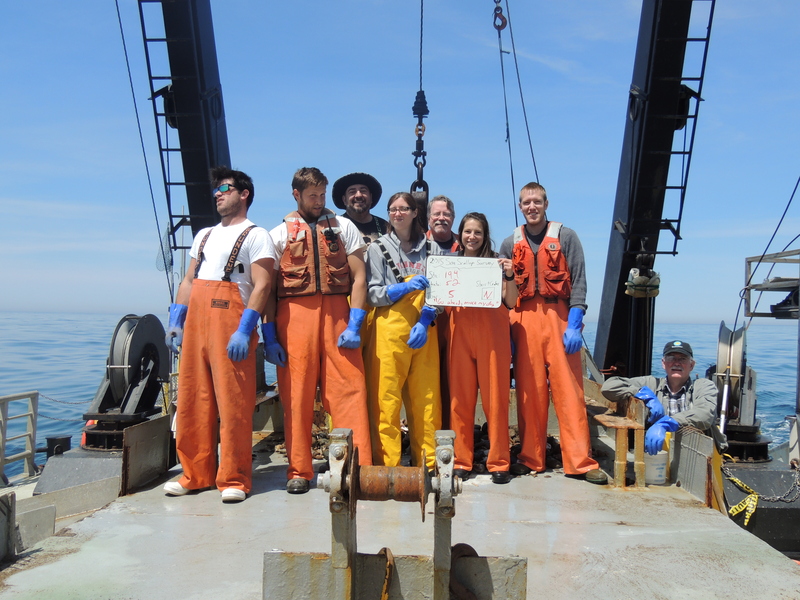 We’ve been doing science 24/7 while at sea, and even with twelve highly accomplished people in the science party, I know we only scratched the surface and these folks have mountains of work ahead of them back at their offices in Woods Hole. I also know that much of that work will involve healthy doses of pretty complex math. I saw an episode of NOVA recently that said something like “science is the story of everything, but the language of that story is told through mathematics.” Let kids do science; through those experiences, they’ll learn more and ask more questions than they can answer and before they realize it, have learned a ton of math – and how to solve their own problems. Before these scientists can really dig in on the heavy math, the data we were collecting has/had to be sorted and organized appropriately. 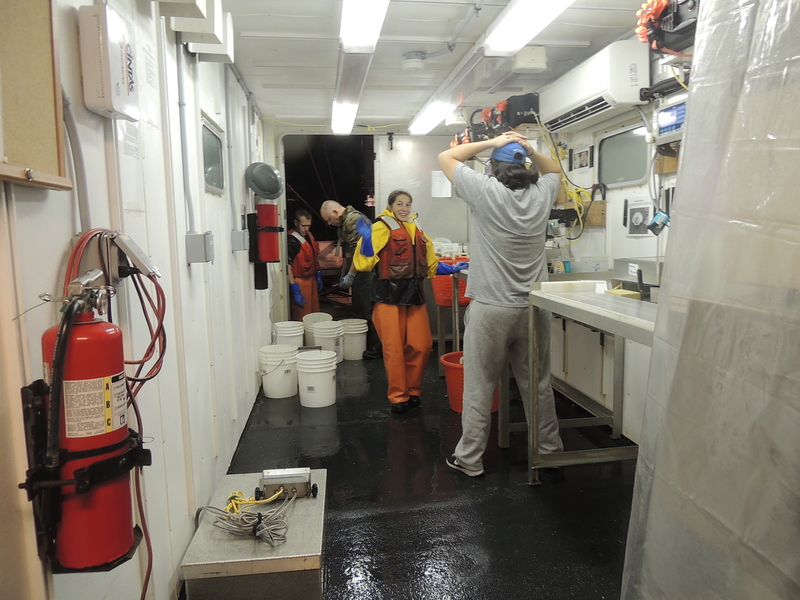 On the dredge, we did most that in the wet-lab, where we physically counted, classified, measured and weighed the species we caught. 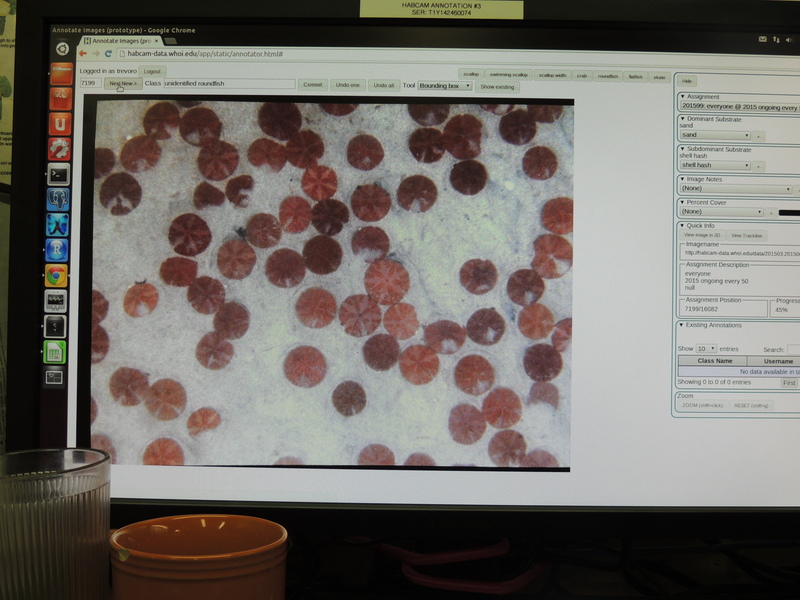 While using HabCam, we were in the dry lab and the photos and data was collected on the PCs connected to the fiber-optics cable. 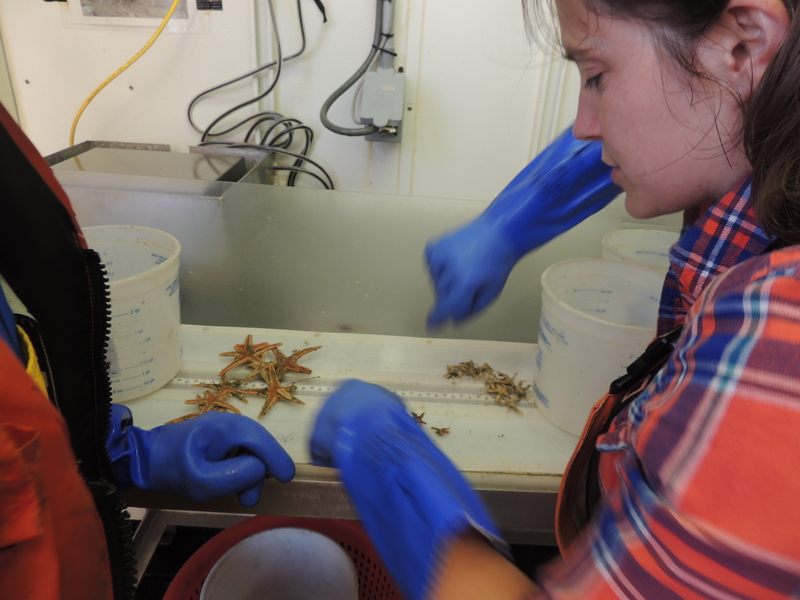 The hands-on, real-person data collection associated with the dredge is important in fisheries science for many reasons. 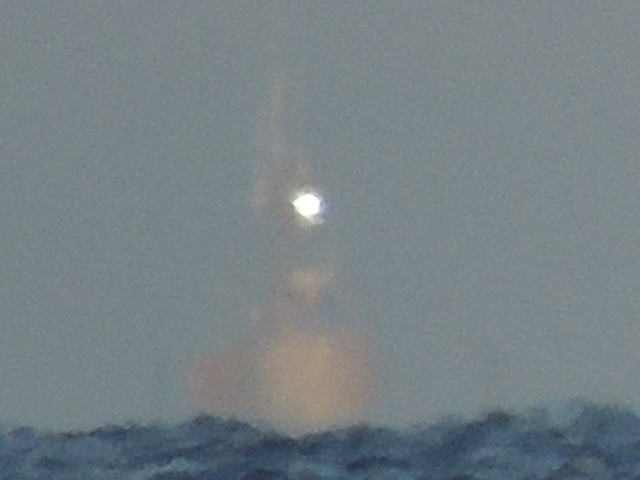 For example, estimated weights of things seen in the HabCam photos can only be estimated with any degree of accuracy if they are based on actual data. Additionally, there are some things you simply cannot determine through non-invasive means, as I experienced first hand assisting Dr. Gallager in the wet lab. 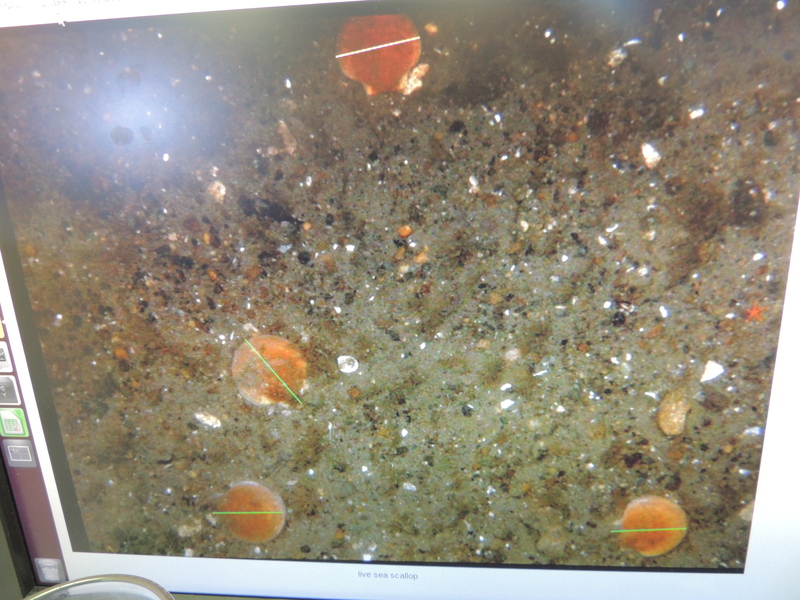 While weighing and measuring the organs of his scallop sample we saw that scallop populations in warmer water had spawned, but some of those in deeper/colder water had not yet done so. People like Drs. 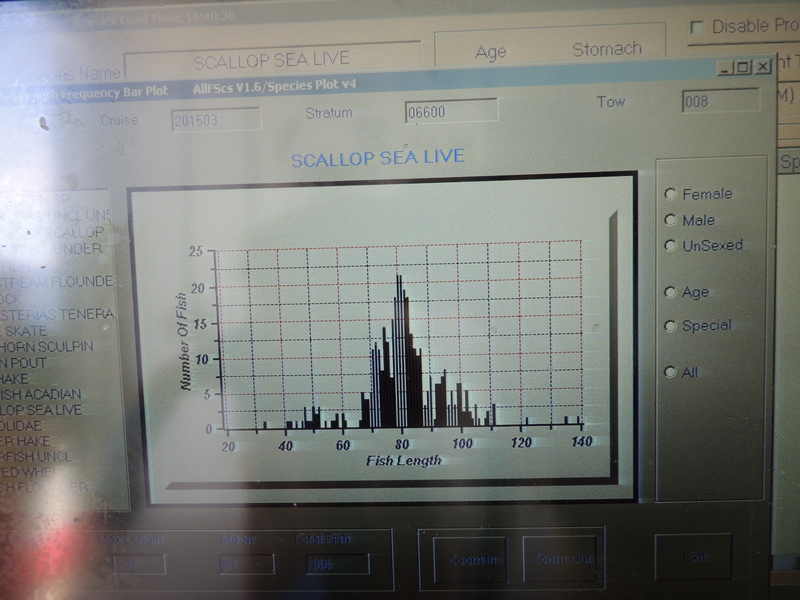 Gallager and Shank can use that information and combine it with data relating to currents and historical data as they develop hypothesis of where to expect scallop populations (they call them “recruitments”) to develop in the future. One of my jobs was to be in charge of a tool called “Star Oddi” which consists of a small, bullet-shaped underwater data logger that collects information such as temperature, depth, salinity and tilt of the dredge (it does get flipped over from time to time) as it is towed along the sea floor. 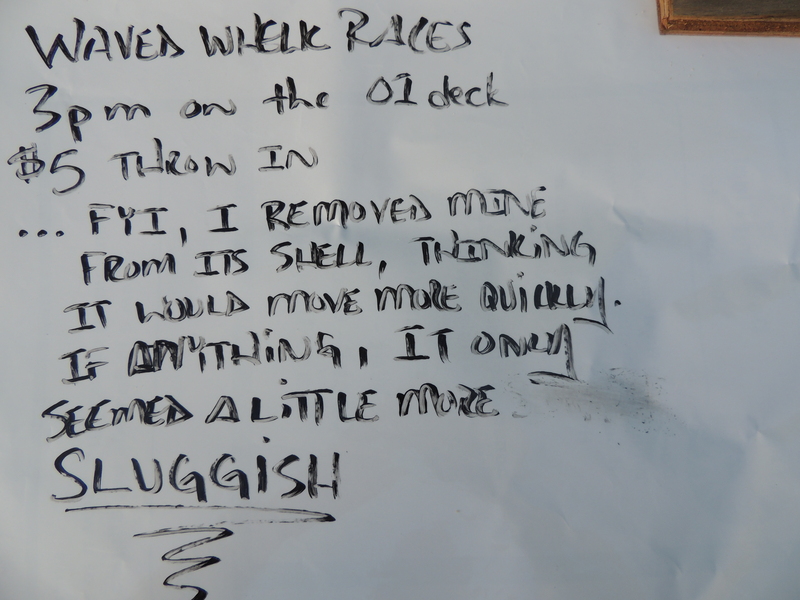 I would trade out the data-logger between each dredge, upload the data to a PC, and tell our watch chief if I noticed anything outside of the expected ranges. Between times piloting the HabCam, we would help annotate some of the photographs, identifying substrate and species seen in the individual photos. For scallops, we used the mouse to draw a line indicating the size of each scallop. 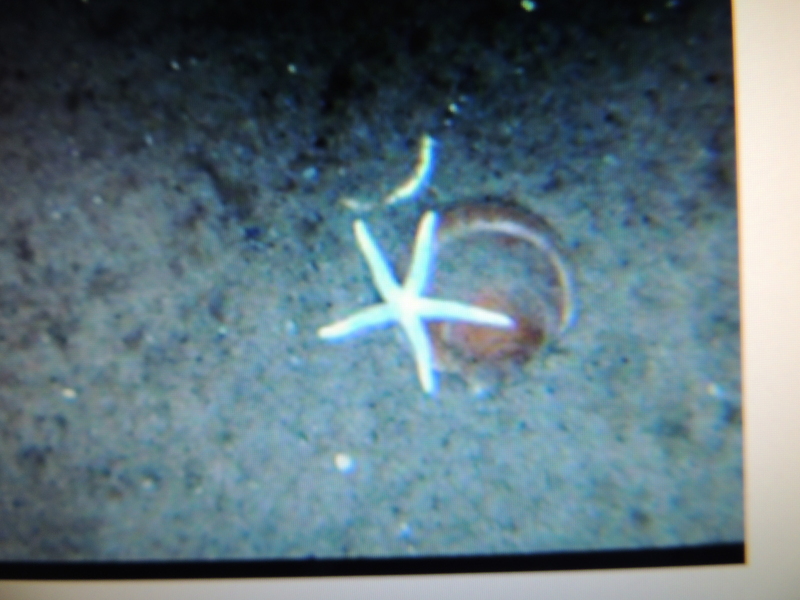 There are four scallops in the annotated photo below. I’ve drawn a line (in green) from the scallop’s umbo to the front of their shells, or across their width if they didn’t completely fit on the screen. The shadows could also help us identify whether they were swimming or stationary on the sea floor. 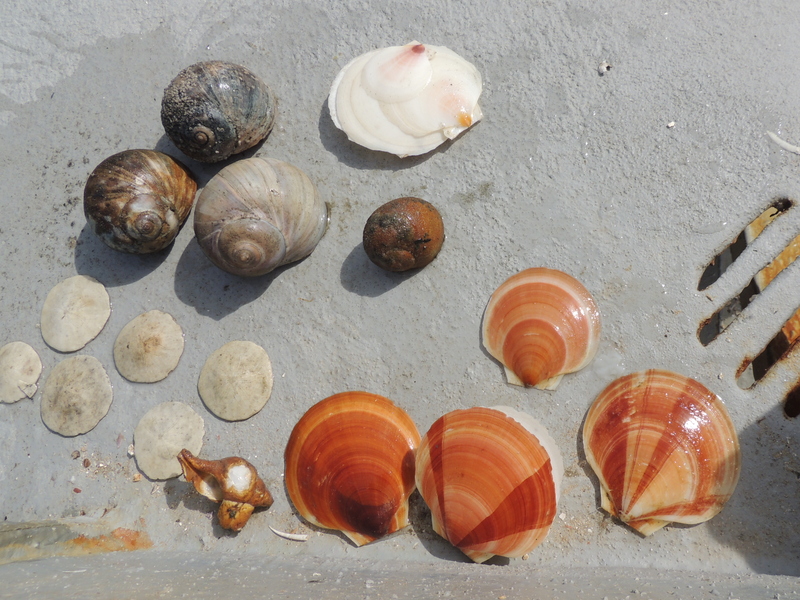 Using the HabCam’s recorded distance from the ground, the computer could then determine their respective sizes with relative certainty, which will help scientists estimate their respective weights, which all plays into determinations of how many scallops there are and whether the species, as a whole, is healthy. Many people hear the word “fishery” and think of a plants and a “nursery,” and they are similar in that they are places where something is raised for commercial purposes, but, most fishery production occurs in what would be considered publicly accessible water, like the ocean. In our earlier discussions, you realized that with its favorable water and currents, Georges Bank is ripe territory for marine life, and historically, Georges Bank has been considered the world’s most productive fishery. Indeed, Georges Bank has played a key role in the culture and economy of New England for more than 400 years. An April 2012 issue of Down East magazine (note to folks who don’t have a “Mainah” for a mom: “Down East” is a slang term typically applied to the upper east coast of Maine) noted that by the time of the Mayflower voyage, the cod fishing stations at Damariscove and Monhegan islands had been operating year-round for the better part of a decade. 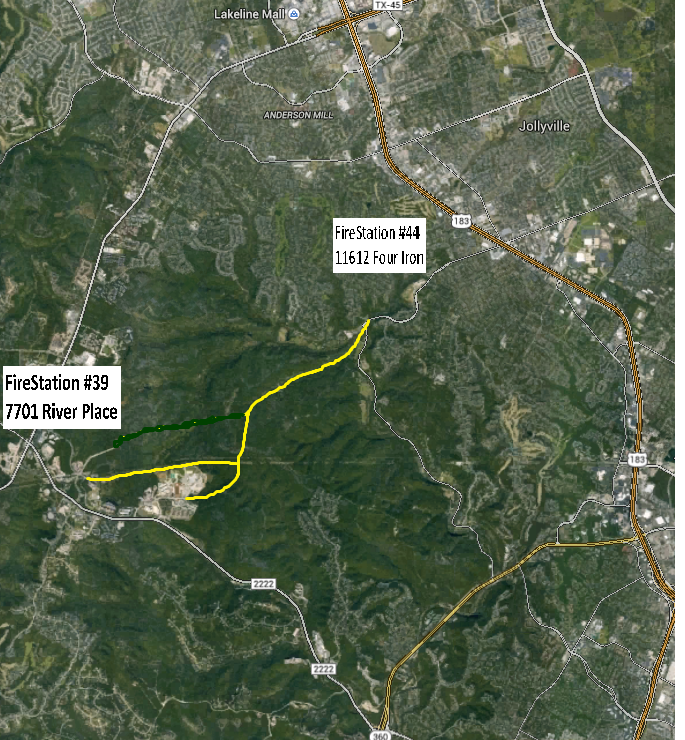 Locally, my students are in the middle of a real world study of this TEKS, as a recently elected Austin city councilman has proposed a road through the middle of the Balcones Preserve behind our school, saying the road will provide a “fire break.” As you might imagine, the idea has gotten the attention of some local interest groups and home owners in the neighborhood around the school. For the lesson, my students were told that their role was simply to read the articles about the proposed road and combine it with existing knowledge gained in my classroom, follow the TEKS, and predict changes to the ecosystem if the road is ultimately built. 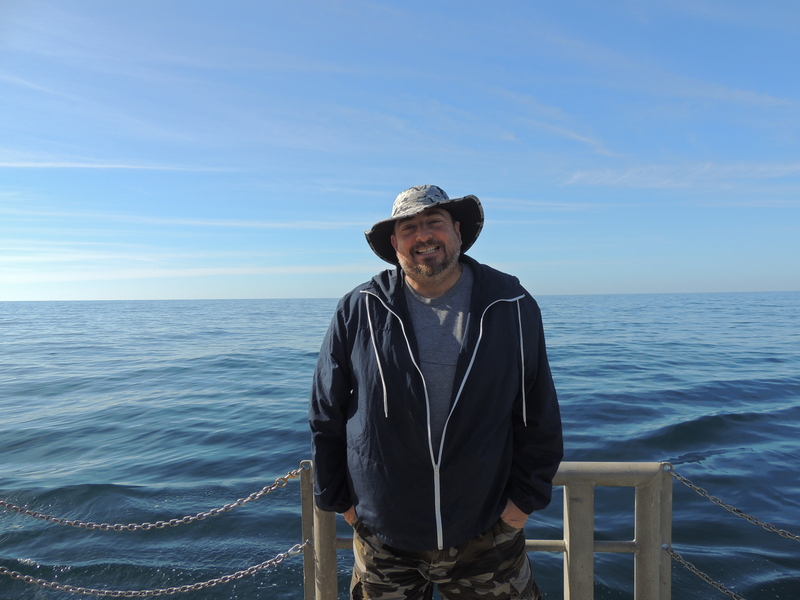 While for my students, their predictions relate to the “highway” aspect of the TEKS, “overgrazing by humans” and the idea of “a ship highway” in the seas offer some parallels to the fisheries we’ve been surveying on this cruise. For nearly 350 of the 400 years commercial fishing has been happening off the coast of New England, regulations were negligible, and the area experienced heavy fishing by American fishers as well as vessels from other countries. It wasn’t until 1976 that the federal government adopted the Magnuson Fishery Conservation and Management Act, which gave the United States the exclusive economic zone that includes Georges Bank and set up a system of industry regulation. Fishermen: In one chair sit the fishermen and the people who work for them. Companies: In another chair sit the non-fishing companies who meet market demand, buying, selling, processing, transporting, etc., seafood. Consumers: In another chair sits the consumers who buy and eat seafood. Environmental/non-profit groups: Standing on a truffula tree stump, speaking on behalf of the fish. Whoa, what’s up with the blood pressure spike? Did I strike a chord? 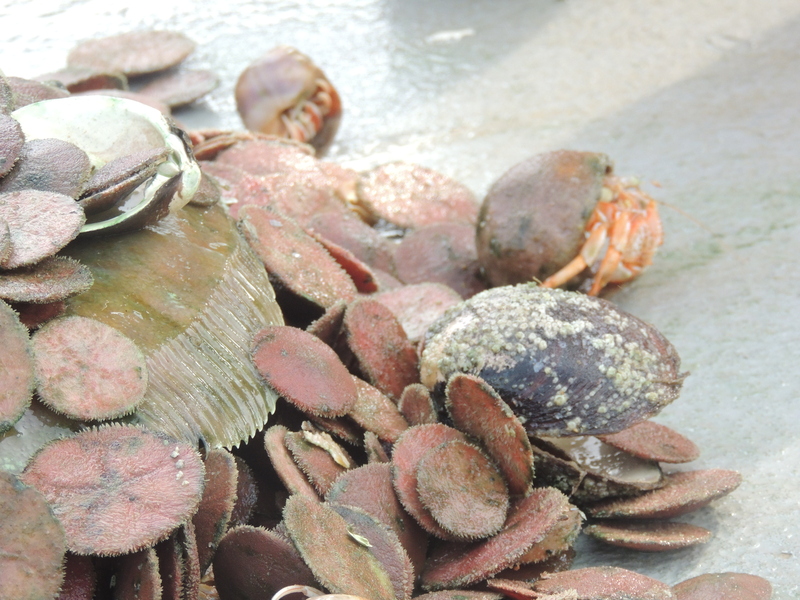 Through these management efforts, scallop populations have rebounded significantly, with the permitted (dredge-net) ring-size, limitation of days at sea/total allowable catch, and “closed-area” management tools getting much of the credit. The rebound is certainly noteworthy considering that the Atlantic Sea Scallop fishery, which extends from the Mid-Atlantic area near Cape Hatteras, NC up to Georges Bank, is the largest and most valuable wild scallop fishery in the world, valued at nearly $580 million in 2011. While much of the research and management is funded by the government, it is important to acknowledge the commercial fishery’s contribution through the Scallop Research Set-Aside Program. 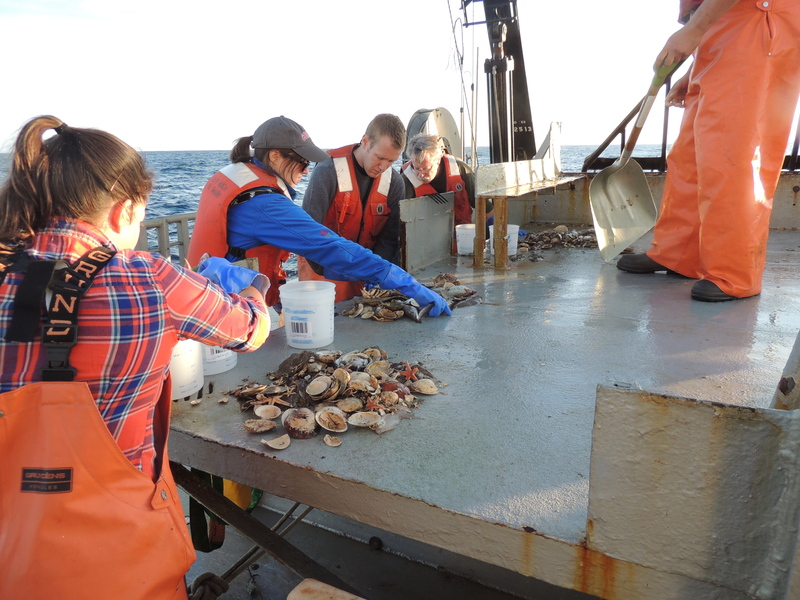 Through that program, 1.25 million pounds of the allowed scallop harvest is set aside each year to fund scallop habitat research and surveys to better inform future policy/management decisions. Well, that’s the million-dollar question, isn’t it? Scallop populations have responded well to these regulatory/management efforts, while other species, such as cod, continue to struggle mightily. As the scallop population returns to (and maybe even starts to exceed) what have been called “sustainable numbers,” the “closed areas” management tool presents some unique questions, primarily relating to an idea called “carrying capacity.” Carrying capacity essentially asks “how many scallop can survive here before there are too many for the system to stay healthy?” For the fishers, the water can seem bluer on the other side of the fence (or, um, something like that) and they want to see these areas re-opened, but variables have to be considered and data confirmed for conclusions to be both reliable and valid. In other words, there is a risk of irreparable harm if an area is opened for fishing too soon or too late. 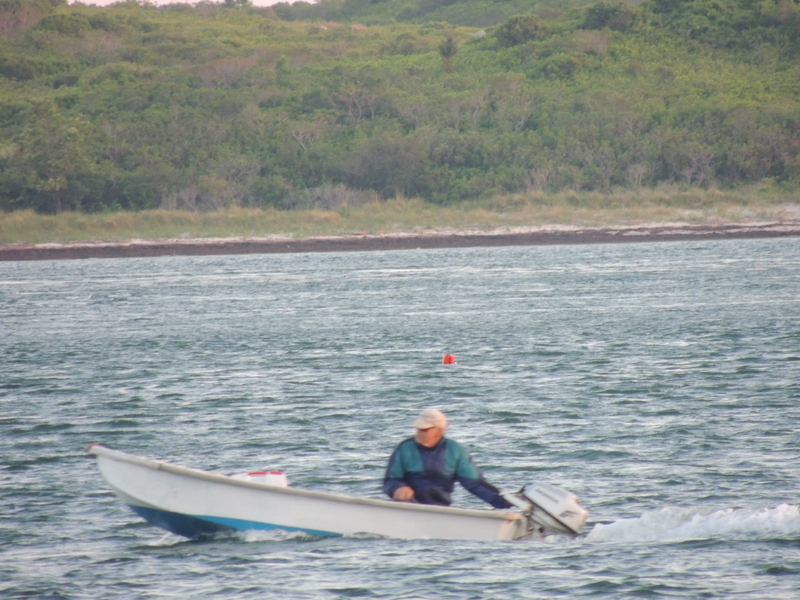 I mention carrying capacity because while I was aboard the Sharp, the New England Fisheries Management Council announced that it was going to recommend that one of the closed areas of Georges Bank, known as the Northern Edge, be reopened to fishing. The newspapers I read showed that there has been a predictably mixed reaction to the announcement. 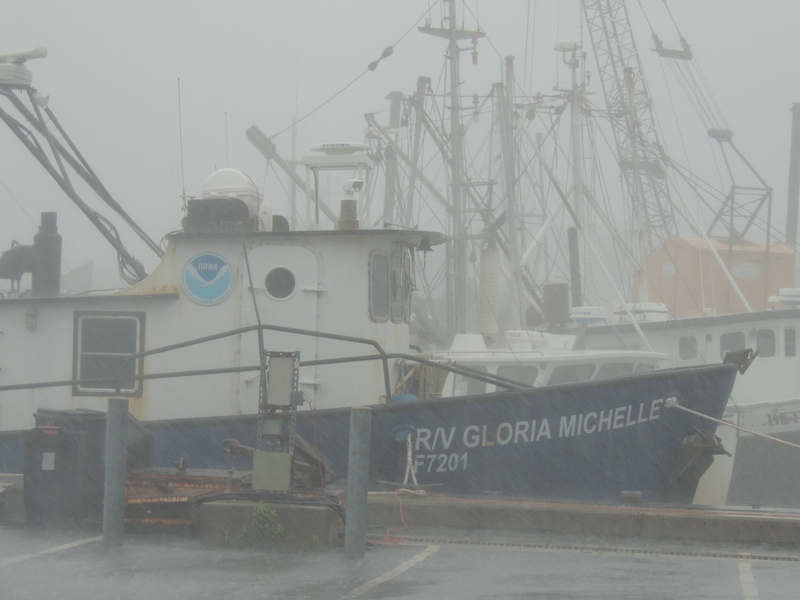 NOAA Fisheries will consider the recommendation by the New England Council and their decision on the recommendation is not expected to be final until some time in 2016. In the last few weeks I’ve introduced you to a few scientists and talked about my role helping to give students an avenue to explore, question and pursue learning about things that interest them in a safe, supportive environment. 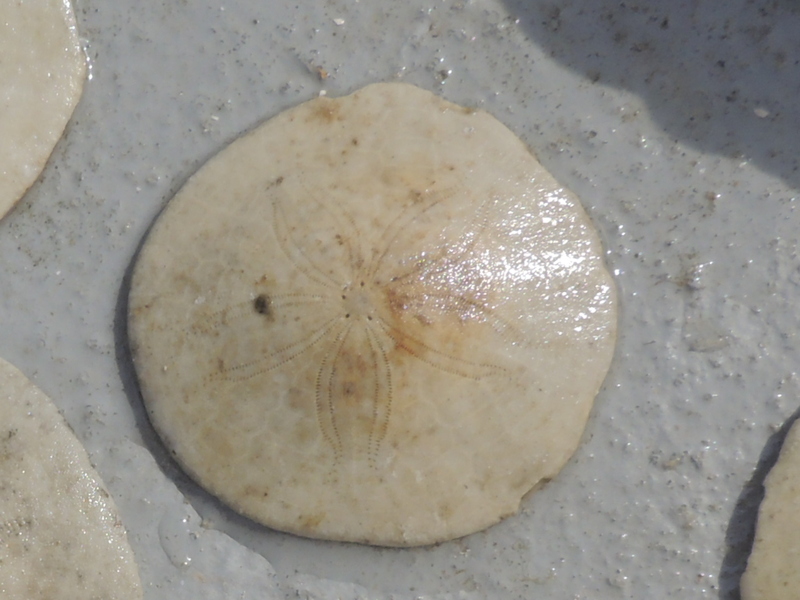 I’m going to close out the Lagniappe section of my TAS blog by introducing you to “what’s next” in scallop science through a conversation with fellow day-watch science-crew member, and Cornell PhD candidate, Katie Kaplan. Katie is a volunteer on this cruise. 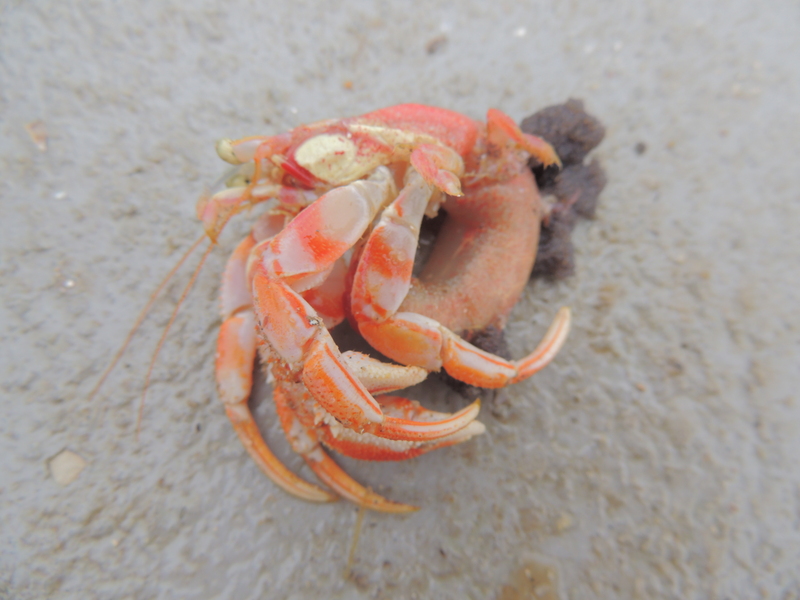 She’s using HabCam data as part of the work towards her PhD and wanted to get a first hand peek at the HabCam in action (I mean, who wouldn’t want to fly over the sea floor and pick fights with crabs and lobsters! ), so, she signed up. Katie’s work fits nicely in today’s blog for several reasons, largely because her work centers on what is happening with the scallops in one of the closed areas I discussed above. Specifically, Katie is evaluating the impacts of marine protected areas on interactions of sea scallops and other species in benthic (i.e. 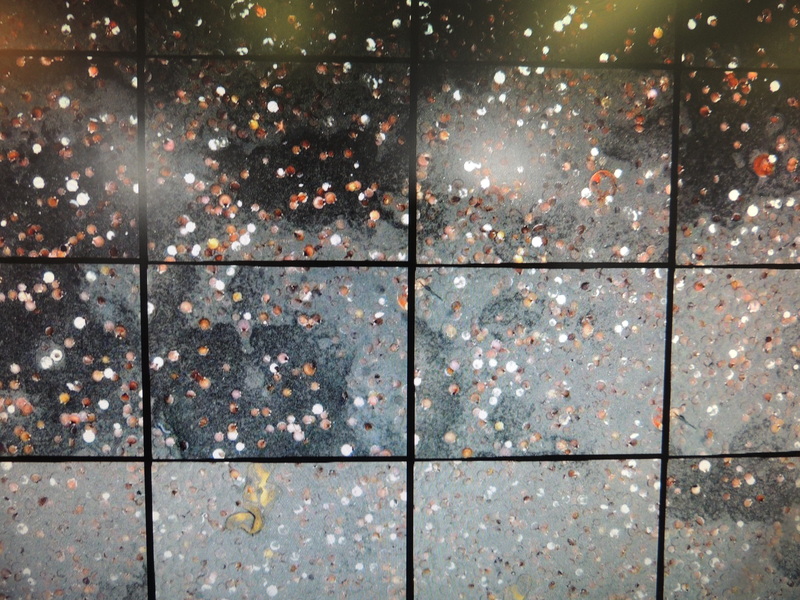 – “seafloor”) ecosystems. 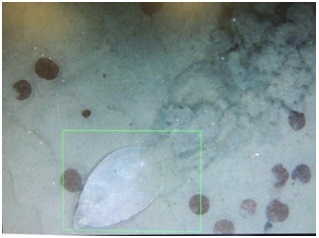 In particular she is evaluating the relationship between an invasive tunicate species, Didemnum vexillum and scallops and the impact of the closed areas on this relationship. 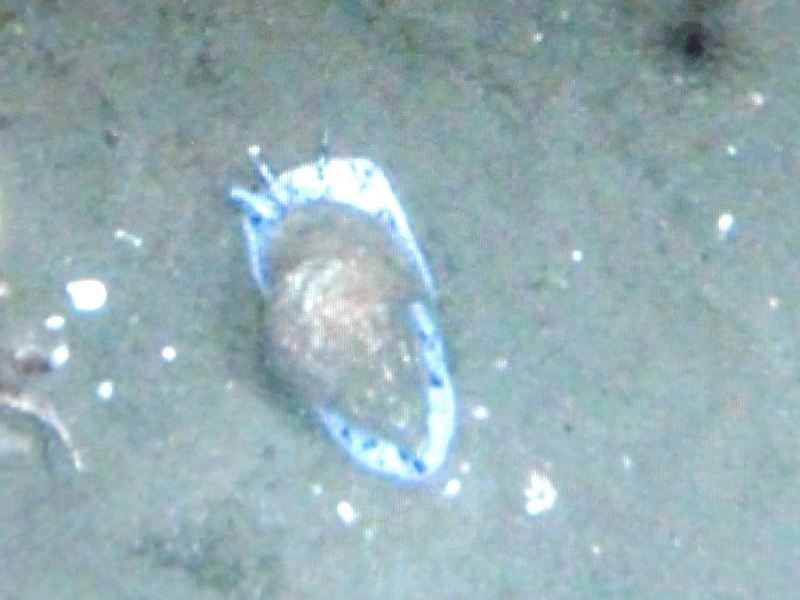 The invasive tunicate has spread in Georges Bank since 2002 and threatens scallop habitat since they compete for the same space (note: with tunicate species being commonly referred to by names like sea “squirts,” “pork,” and “livers,” you might get the impression their “invasion” isn’t perceived as favorable). After a few weeks in my class it should be obvious, but studying interactions among species as they relate to fishery resources is essential to ensuring fish habitat remains viable and fisheries remain productive to meet our needs as consumers. On a more personal note, Katie grew up just outside of New York City and headed to Grinnell College in Iowa for her undergraduate studies. After graduation, she taught English in Ecuador and while living there and on Galapagos, decided to pursue a career that combined her interests in the ocean with her wicked good biology skills (whoa, did I just use “wicked” as an adjective? I’ve been up north too long!). I need to add that while it’s too long a story for the blog, I seem to be having a “Cornell year,” so it is entirely appropriate that I met my new friend Katie on this cruise. Nothing really to annotate in this shot, but, you can see the whole screen. Waved whelk, heading to the 01. HabCam scared a flatfish. He was slingin’ gravel and puttin’ a ton of dust in the air. …I was always on the lookout for the Nisshin Maru; never saw it. Students, always clean up your lab! Go outside and play. Class dismissed. 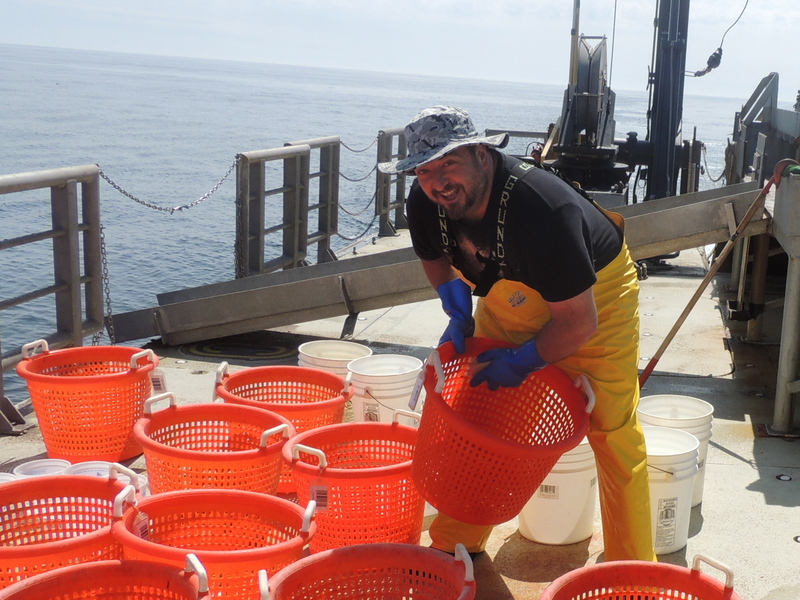 This entry was posted in 2015, NOAA Fisheries Service, NOAA Teacher at Sea, Trevor Hance and tagged byCatch, commercial fishery, Georges Bank. Bookmark the permalink.